Hailing from legendary BBQ oasis Kansas City, it should not be any surprise Kathy Pullin has a love for BBQ. 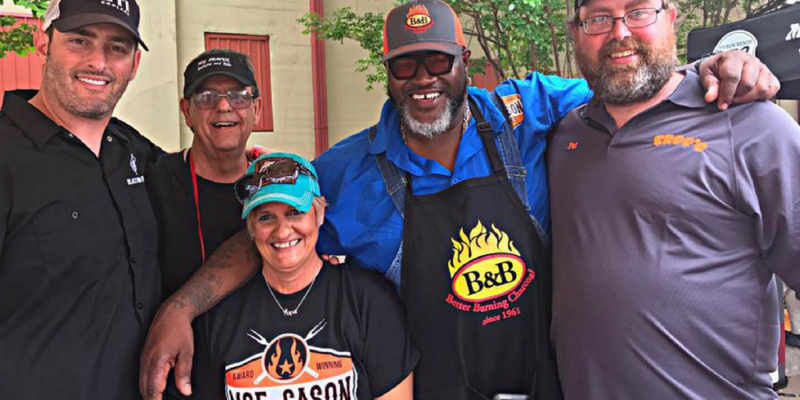 However, it wasn’t until Kathy participated with a team at the American Royal Open in 1994 and 1995 that Kathy was truly hooked on the art of creating great BBQ. Still working full time in the insurance industry, Kathy spent nights and weekends honing her craft by catering private events as Sassy Sauceless BBQ. in 2011, Kathy launched Pullin Premium BBQ and has never looked back. Kathy has retired from the insurance career to focus full-time on BBQ. Kathy makes regular appearances on SA Living doing live cooking segments, catered several times for KJ97 at the San Antonio BBQ cook-off and has cooked for several musical artists and tv personalities. In her spare time, Kathy and her husband spend free time at their beach house Texas Coast fishing and BBQing. Kathy is a domestic violence survivor and volunteers at various domestic violence organizations in the area. While holding pork tenderloin slice knife lengthwise through meat, but don’t cut all the way through. Open pork like a book and pound flat with a mallet till tenderloin is about 1/4 to 3/8″ thick. Sprinkle both sides with rub mixture, place onion and pepper mixture across the top of the pork and roll tightly. Secure tenderloin with butchers twine, sear over hot coals, remove from direct heat and finish cooking till done.